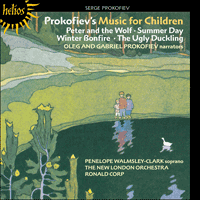 Once we understand Prokofiev’s own child-like nature we need not be surprised that he took to writing children’s music like the duck (in his own Peter and the Wolf) took to jumping into – and, less sensibly, out of – the water. He had a truly child-like guilelessness of spirit: life for him was always a great adventure, with the unexpected lurking round every corner. Excitement was constantly in the air, everything was a cause for wonder, and when he declared that the composer’s business was ‘to serve his fellow men, to beautify human life and point the way to a radiant future’ (my italics) he wasn’t just rehearsing some mandatory Soviet ideological platitude but stating, simply and sincerely, his own artistic credo. No wonder his music has such vitality and colour. To the end he viewed the world as a child views it: hopefully and with joy in his heart. He had more than his fair share of misfortunes and disappointments – particularly after his return to Soviet Russia – but the light never went out. He believed, as children do, that all the best story books have Happy Endings. Certainly Prokofiev’s own ‘stories’ for children end happily – and there are quite a number, not merely those recorded here. The first was The Ugly Duckling, a setting of an adaptation (by Nina Meshchersky, Prokofiev’s first ‘real’ girlfriend) of Hans Christian Andersen’s well-known fairy tale. The piece is not, however, designed specifically for children, who would probably be bewildered by the absence of ‘melodious’ melody. The text is in prose, not verse, and is set à la Mussorgsky as continuous melodic recitative: the form is that of a miniature operatic scena in which voice and orchestra set the drama to music as it unfolds, without formalizing it. The original voice and piano version was basic duckling, though hardly an ugly one! Prokofiev proceeded then to turn it into a large and beautiful orchestral swan in a way that relates interestingly to contemporaneous trends in Russian art: the bird and animal characterizations suggest the bright, sharp colours of Larionov, Goncharova and the Primitivists, whereas the nature-music – the deepening dark and cold of winter, the coming of spring and sunshine – is more akin to Impressionism (Borisov-Mussatov and Larionov’s early work). 1936 was the year of Peter and the Wolf (of which much more anon); 1936–9 yielded the delightful Three Children’s Songs; out of the misery of the war years came the fairy tale ballet Cinderella, all dazzling and glittering in its finery; then in 1949–50, even though by then Prokofiev was mortally sick, he produced two substantial works, the children’s suite Winter Bonfire and the oratorio On Guard for Peace. Both involved a children’s choir singing words by the Soviet children’s poet Samuil Marshak, and both were first performed in Moscow on the same evening (19 December 1950) with Prokofiev’s indefatigable champion Samuil Samosud conducting. Winter Bonfire is a day in the life of some ‘young pioneers’ and describes an expedition to the country in winter. Peter might have been among them – his basic key of C major is theirs too – but whereas Peter’s music had more than a touch of Euro-Classical sophistication, Winter Bonfire is Russian through and through and of egregious pedigree (Tchaikovsky and Mussorgsky, both renowned for the authenticity of their children’s music). Prokofiev’s train-music (‘Departure’ and ‘The Return’), his whirlingly vigorous ice-skater’s waltz and the march which leads straight into ‘The Return’ are among his most winning inspirations, as is his use of tremolando strings in ‘The Bonfire’ to depict the shimmer and glow of the fire. The children’s choir which sings in ‘Chorus of the pioneers’ foreshadows the more extensive use of children’s voices (solo and en masse) in On Guard for Peace, in the gala-finale of which they metaphorically release large flocks of (emblematic) doves into the summer sky over Moscow. No wonder he was excited. I went to a box opposite the manager’s and could just make out Prokofiev in the semi-darkness (before that, I had only seen photos of him). The performance went very badly and when afterwards I was introduced to him I felt so awful I couldn’t even smile properly. In his ginger-coloured foreign suit he seemed stiff and haughty. He answered my questions reluctantly and monosyllabically. His wife and children, on the contrary, were pleased and friendly, and I thought I might hope to see the family again. That hope was fulfilled. A week later, the Prokofievs came to our play The Story of Dzyuba. I sat in the box with them from the beginning and was able to observe Prokofiev’s reactions, which were even more spontaneous than his sons’. He laughed loudly and sincerely, and made all sorts of comments. What he liked, he liked very much, but his dislikes were just as intense. It took me some time to get used to his curt replies, but by and by I began to feel quite easy in his presence. He was sincere and frank. My first impression of him as stiff and haughty proved quite erroneous: he wore that mask only when he was out of humour and wanted to be left alone. It was remarkable that Prokofiev had kept his Russian spontaneity after living so long abroad. The Prokofievs apparently liked our theatre and saw almost the whole of our repertory. Prokofiev’s sons enjoyed going to their own theatre, a theatre for children. This was something they had not been able to do abroad. I knew that Prokofiev had written a few works for children – The Ugly Duckling after Andersen, and the Tales of an Old Grandmother – and I dreamed of making him write something for us. It was my greatest passion to stimulate creative genius to add to the treasury of artistic works devoted to children. What I had in mind was a fairy tale for symphony orchestra in which music and speech would be combined. I had never heard of such a work before, but it seemed a not impossible idea: trying to connect speech and music in some entertaining way, to hold our children-audience’s attention? The type of ‘symphonic fairy tale’ I had in mind might help us to introduce the children to the musical instruments and their specific sounds. Should I perhaps commission one of our regular composers to do it? No, the only name I could think of was Serge Prokofiev. I decided to wait for the right moment to approach him. It came when the founding of the Central Children’s Theatre opened up new horizons for us. I thought it would be a good idea to invite Prokofiev to see our new building. He came, was in a good mood, and the concert was an immense success. He was no longer coldly official to me. A couple of days later I phoned him and asked permission to see him on a very important matter. He told me to come in two days. It turned out that he was playing chess with a friend by telephone, doing a number of other, more important things at the same time. My host was obviously bursting with energy, and had many varied interests, but there was order in that chaos. I had to start probing, or else he might hurry off somewhere. How should I begin? ‘Do your boys study music?’ ‘Yes, they do, but it’s a waste of time. No ability at all.’ Clearly that wasn’t going to get me what I wanted. I tried again. Prokofiev seemed to be interested and I went into my plan in more detail trying to be as specific as possible, which he liked. I left feeling I had made some progress, Prokofiev had listened to me attentively, but I knew he would not be talked into doing anything he didn’t want to do. A few days later the telephone rang: he did want to do it. He spent a whole evening at my piano working out a scheme, a story. We decided the main purpose would be to introduce very young children to the instruments of the orchestra. I suggested that the characters might be animals and birds, and at least one human personage. The end result was that the Central Children’s Theatre officially commissioned Prokofiev to write a symphonic piece for what seemed an embarrassingly modest fee, but it was all we could afford. He signed the contract without a murmur. Prokofiev was right. The fragile and complex process of creation had already begun in him, and the diligently written doggerel that had nothing to do with the music had naturally infuriated him. Luckily, I was quite unafraid of him by that time, and he accepted my suggestions with unexpected enthusiasm. ‘What if we add another character to our cast – the boy’s Grandfather? That’ll be another fine contrast: one is merry, lively and fearless, the other slow-moving and cautious, grumbling all the time: ‘Supposing you get into trouble – wha-at then?’’ I said that ‘what then’ in a twangy old man’s voice. Prokofiev suddenly snatched up a sheet of notepaper and cried, ‘Say ‘what then’ again, I liked your intonation’. The way he wrote it, the phrase came out as a perfect fifth – a long F, a short F, and a B flat. ‘Let’s have Grandad by all means’, Prokofiev said resolutely. Prokofiev agreed, but he said he’d come immediately to rehearse me a bit. He wanted me to recite the text that evening. He wrote it out for me parallel with the music, the way he wanted it to sound in actual performance. Later I would have to learn my part thoroughly to recite it artistically, in time with the music, but that night I might be excused for fluffing my lines in all the excitement. There were about a dozen children at that first performance in my office. ‘Early one morning’, I began, ‘Peter opened the gate and went out into the big green meadow …’ And so on. The children liked the piece, I could tell that at once by the way they listened. Children sometimes praise a work enthusiastically when it is over, but they fidget and chat during the performance. And here the little imps were sitting as quiet as mice, though the symphony lasted twenty-four minutes without a break. ‘Is that the end?’ asked a disappointed voice, and several others clamoured for more. Prokofiev had to play the final march three times over. You can imagine my joy to be at the birth of a musical masterpiece, one that would help millions of children to understand music and come to love it. Prokofiev finished the orchestration in a week. Imagine – the whole work written in little more than two weeks! On 5 May 1936 the children’s symphony orchestra of our theatre was due to play at a festival of Soviet art. Journalists and tourists from France, Great Britain and America were expected. There would be a surprise for them – a new work by Serge Prokofiev, whom they knew well, a work he had written after his return to Moscow. Peter and the Wolf created a sensation. Newspapers and magazines both in this country and abroad wrote of it, and the May concert was the beginning of its long life in concert halls throughout the world. It probably never crossed Prokofiev’s mind that the younger of the two sons he described as having ‘no ability’ to Satz – Oleg, born in 1928 – would one day be performing the speaker’s part of Peter and the Wolf. He would have been even more surprised, and no doubt amused, to know that three generations of Prokofiev have now recorded it. Lina, his wife, was the first (in 1986, for Chandos); and now Oleg, a distinguished painter and sculptor, has adapted the text so as to involved his own son Gabriel, who has inherited his grandfather’s twin passions for music and the theatre and at sixteen is already an accomplished horn-player and actor. The way it has turned out makes one regret all the more that Prokofiev never wrote a full-scale theatre piece for children actually to perform and sing in. Pour ne plus être surpris que Prokofiev se soit mis à écrire de la musique pour enfants avec autant de plaisir que le canard (dans son histoire Pierre et le Loup) prit goût à se mettre à l’eau – et, moins raisonnablement, à en sortir, il faut comprendre que la nature de ce compositeur était d’une innocence d’enfant. Il possédait une candeur d’esprit vraiment enfantine: la vie, pour lui, demeurait une grande aventure, où l’imprévu pouvait surgir de tous côtés. Il n’est donc pas surprenant que sa musique ait une telle vitalité et une telle couleur. Jusqu'à la fut il jeta sur le monde un regard d’enfant: plein d’espoir et le cœur joyeux. Il eut dans sa vie plus que sa part d’infortunes et de déceptions – surtout après son retour en Russie soviétique – mais sa vision du monde ne se ternit jamais. Il croyait, comme le font les enfants, que toutes les meilleures histoires se terminent bien. Ses propres histoires pour enfants ont certes une fin heureuse – et il y en a un grand nombre, bien d’autres encore que celles qui sont enregistrées ici. La première fut Le vilain petit canard, mise en musique d’une adaptation (par Nina Meshchersky, la première «vraie» petite amie de Prokofiev) du conte de fées bien connu de Hans Christian Andersen. Le morceau n’est cependant pas destiné spécialement aux enfants, que l’absence de mélodie «mélodieuse» aurait probablement déroutés. Le texte est en prose et non en vers et il est composé à la Moussorgsky comme une mélodie récitative continue: la forme est celle d’une scène d’opéra en miniature dans laquelle voix et orchestre harmonisent le drame avec le développement de la musique, sans la formaliser. À part les Contes d’une Vieille Mère-Grand pour piano, en 1918 (ici encore, comme dans Le vilain petit canard, ce n’est pas tant une musique pour enfants qu’au sujet d’enfants, ou de leur monde), Prokofiev ne retourna pas à ce thème avant le milieu des années 1930. Il était à ce moment-là marié et père de deux enfants et avait décidé de s’installer définitivement en Russie soviétique – où, bien entendu, les principes de contrainte par indoctrinement visaient particulièrement les enfants, et où les compositeurs étaient incités à écrire pour «le peuple» en général et les «jeunes» en particulier. D’où les douze morceaux pour piano, courts et simples, opus 65, Musique pour Enfants, assez simples pour être interprétés par des enfants, composés en 1935 en même temps que le ballet Roméo et Juliette. En 1941, le compositeur choisit sept de ces douze morceaux et les adapta pour petit orchestre, sacrifiant leur transparence en ce faisant, mais leur donnant une nouvelle dimension de couleur et aussi, bien entendu, leur permettant de s’adresser à une bien plus large audience. Il donna à la «nouvelle» œuvre un nouveau titre, Jour d’Été. 1936 fut l’année de Pierre et le Loup (dont nous parlerons davantage plus loin); 1936–39 donnèrent les charmantes Trois chansons pour enfants; des souffrances des années de guerre sortit le ballet conte de fées Cendrillon, éblouissant et scintillant dans sa subtilité; enfin, en 1949–50, bien que Prokofiev fut alors atteint d’une maladie mortelle, il produisit deux œuvres importantes, la suite pour enfants Le Feu de joie hivernal et l’oratorio En garde pour la paix. Ces œuvres comprennent toutes deux un chœur d’enfants chantant les paroles du poète soviétique Samuil Marshak, qui écrivait pour les enfants, et toutes deux furent représentées pour la première fois à Moscou, le même soir (19 décembre 1950) sous la direction de Samuil Samosud, l’infatigable défenseur de Prokofiev. Le Feu de joie hivernal décrit une journée de la vie de quelques «jeunes pionniers» et une excursion à la campagne en hiver. Pierre aurait pu être des leurs – son ton fondamental d’ut majeur est aussi le leur – mais tandis que la musique de Pierre gardait plus d’une trace de sophistication euro-classique, Le Feu de joie hivernal est purement russe d’un bout à l’autre et appartient à une fameuse lignée (Tchaïkovsky et Moussorgsky, tous deux célèbres pour l’authenticité de leur musique pour enfants). La musique-train de Prokofiev («Départ» et «Retour»), sa valse des patineurs à la vigueur tourbillonnante et la marche qui conduit droit au «Retour» comptent parmi ses inspirations les plus charmantes, comme le fait son utilisation de cordes tremolando dans «Le Feu de joie» pour décrire le chatoiement et l’incandescence du feu. Le chœur d’enfants qui chante dans «La Réunion des pionniers» annonce l’utilisation plus importante de voix d’enfants (solo et en masse) dans la finale de gala de En garde pour la paix, où ils libèrent métaphoriquement de grands envols de colombes (emblématiques) dans le ciel estival de Moscou. Je savais que Prokofiev avait composé quelques œuvres pour enfants – Le vilain petit canard d’après Andersen, et les Contes d’une vieille Mère-Grand et mon rêve était de lui faire composer quelque chose pour nous. Ma plus grande passion était de stimuler le génie créateur afin d’augmenter le trésor d’œuvres artistiques consacrées aux enfants. Je pensais à un conte de fées pour orchestre symphonique dans lequel seraient combinés musique et paroles. Je n’avais encore jamais entendu parler d’un tel ouvrage, mais ce ne me semblait pas une idée impossible: essayer d’associer paroles et musique d’une façon amusante, afin de retenir l’attention de notre audience enfantine? Le genre de «conte de fées symphonique» auquel je pensais pourrait nous aider à présenter aux enfants les différents instruments musicaux et leurs sons particuliers. Peut-être devais-je demander à un de nos compositeurs habituels de le composer? Non, le seul nom auquel je pouvais penser était celui de Sergei Prokofiev. À cette époque-là, Prokofiev n’avait pas d’appartement à Moscou et vivait à l’Hôtel National. À mon arrivée, il me reçut très gracieusement, m’offrit un café qu’il avait fait lui-même et qui était très bon et tout un assortiment de friandises. Je regardai autour de moi. Le piano était ouvert, il y avait des feuilles de papier partout. Des livres étaient sur la table, ainsi qu’un échiquier avec ses pions. Mon hôte était visiblement un homme plein d’énergie et qui s’intéressait à un très grand nombre de choses très variées, mais il y avait de l’ordre dans ce chaos. Je devais commencer à le sonder ou il pouvait partir ailleurs rapidement. Comment aborder le sujet? Prokofiev sembla être intéressé et je continuai à expliquer mon projet avec plus de détails en essayant d’être aussi précise que possible, ce qui lui plût. Quelques jours plus tard, le téléphone sonna. Il voulait le faire. Il passa une soirée entière assis à mon piano, à établir un plan, une histoire. Nous décidâmes que le but principal serait de présenter à des très jeunes enfants les instruments de l’orchestre. Je suggérai que les personnages pourraient être des animaux et des oiseaux, et au moins un personnage humain. Le résultat final fut que Prokofiev reçut une commande officielle du Théâtre Central pour enfants de composer un ouvrage symphonique pour des honoraires qui paraissaient terriblement modestes, mais c’était tout ce que nous pouvions offrir. Il signa le contrat sans un murmure. Il y avait environ une douzaine d’enfants à cette première représentation, dans mon bureau. «De bon matin, commençai-je, Pierre ouvrit la barrière et s’avança vers une grande prairie verte …» Les enfants aimaient l’ouvrage, je le savais à la façon dont ils écoutaient. Quelquefois, les enfants sont pleins de compliments sur un ouvrage quand il est fini, mais ils s’agitent et bavardent durant la représentation. Et dans ce cas-ci, les petits diables étaient assis aussi sages que des images, bien que la symphonie durât vingt-quatre minutes sans arrêt. «C’est fini?» demanda une voix déçue, et plusieurs autres en voulaient encore. Prokofiev dut rejouer la Marche finale trois fois. Le 5 mai 1936, l’orchestre symphonique d’enfants de notre théâtre devait jouer dans un festival d’art soviétique. Des journalistes et des touristes de France, Grande-Bretagne et Etats-Unis devaient y assister. Il y aurait une surprise pour eux – une nouvelle œuvre de Sergei Prokofiev – compositeur qu’ils connaissaient bien, une œuvre composée depuis son retour à Moscou. Pierre et le Loup fit sensation. Les journaux et les magazines russes et étrangers en parlèrent, et le concert de mai fut le début de sa longue vie dans les salles de concert à travers le monde entier. Prokofiev aurait sans doute été bien surpris de savoir que le plus jeune de ses deux fils qu’il avait décrits comme «pas doués» à Satz – Oleg, né en 1928 – jouerait un jour le rôle de l’orateur de Pierre et le Loup. Il aurait été encore plus surpris, et sans aucun doute amusé, de savoir que trois générations de Prokofiev l’ont maintenant enregistré. Lina, sa femme, fut la première (en 1986, pour Chandos); et maintenant Oleg, distingué peintre et sculpteur, a adapté le texte afin que son fils Gabriel puisse y participer. Gabriel a hérité des deux passions de son grand-père pour la musique et le théâtre et, à 15 ans, est déjà un joueur de cor et un acteur accompli. En voyant le succès de Pierre et le Loup, on ne peut que regretter que Prokofiev n’ait jamais écrit une œuvre de théâtre de longueur normale destinée à être interprétée et chantée par des enfants. Sobald wir uns Prokofjews eigenes kindliches Gemüt vergegenwärtigen, braucht uns nicht mehr zu überraschen, daß er gleichviel Gefallen daran fand, Musik für Kinder zu schreiben, wie es der Ente (in Peter und der Wolf) gefiel, ins Wasser zu springen – und unvernünftigerweise gleich wieder heraus. Prokofjew war von wahrhaft kindlicher Arglosigkeit: Das Leben bedeutete ihm ein großes Abenteuer, bei dem hinter jeder Ecke das Unerwartete lauert. Ständig lag Spannung in der Luft, alles war staunenswert, und als er erklärte, da es die Aufgabe des Komponisten sei, „seinen Mitmenschen zu dienen, daß Menschenleben zu verschönen und den Weg in eine strahlende Zukunft zu weisen,“ betete er nicht etwa eine vorgeschriebene sowjetideologische Platitüde nach, sondern verkündete schlicht und ernsthaft sein eigenes künstlerisches Credo. Kein Wunder also, daß seine Musik soviel Vitalität und Kolorit besitzt. Bis zum Schluß betrachtete er die Welt mit den Augen eines Kindes: Hoffnungsvoll und mit Freude im Herzen. Er erlebte mehr als seinen gebührenden Anteil an Fehlschlägen und Enttäuschungen – vor allem nach seiner Rückkehr in die Sowjetunion –, aber er ließ niemals das Licht verlöschen. Er glaubte, wie es Kinder tun, daß alle wirklich guten Geschichten ein glückliches Ende nehmen. Jedenfalls gingen seine eigenen „Geschichten“ für Kinder glücklich aus – und davon gibt es eine ganze Reihe, nicht nur die hier aufgezeichneten. Den Anfang machte Das häßliche Entlein, eine Vertonung von Hans Christian Andersens wohlbekanntem Märchen (in einer Bearbeitung von Nina Meschtscherski, Prokofjews erster „richtiger“ Freundin). Das Stück ist nicht ausdrücklich auf Kinder gemünzt, die wahrscheinlich bestürzt wären über die Abwesenheit jeglicher „melodiöser“ Melodik. Der Text ist in Prosa-, nicht in Versform gehalten und à la Mussorgski als fortlaufendes melodisches Rezitativ vertont: Die Musik ist als Opern-Scena in Miniatur angelegt, wobei Gesangsstimme und Orchester das sich entfaltende Drama musikalisch darstellen, ohne es zu formalisieren. 1936 war das Jahr von Peter und der Wolf (davon wird noch eingehend die Rede sein); der Zeitraum 1936–39 erbrachte die entzückenden Drei Kinderlieder; aus dem Elend der Kriegsjahre ging das Ballettmärchen Aschenbrödel hervor, funkelnd und glitzernd in voller Pracht; 1949–50 schrieb Prokofjew, damals schon sterbenskrank, zwei umfangreiche Werke: Die Kinder-Suite Winterliches Lagerfeuer und das Oratorium Auf Friedenswacht. In beiden Fällen hatte ein Kinderchor Texte des sowjetischen Kinderdichters Samuil Marschak zu singen, und beide Werke wurden am selben Abend (19. Dezember 1950) unter der Leitung von Prokofjews unermüdlichem Fürsprecher Samuil Samossud in Moskau uraufgeführt. Winterliches Lagerfeuer schildert einen Tag im Leben einer Schar „Junger Pioniere“ und deren winterlichen Ausflug aufs Land. Peter hätte einer dieser Jungen sein können! – C-Dur, seine Grundtonart, ist auch die ihre – aber während Peters Musik mehr als nur einen Hauch europäisch klassischer Kultiviertheit besitzt, ist Winterliches Lagerfeuer durch und durch russisch, mit einer herausragenden Ahnenreihe (Tschaikowski und Mussorgski, beide bekannt für die Glaubwürdigkeit ihrer eigenen Musik für Kinder). Prokofjews Eisenbahmnusik („Abfahrt“ und „Rückkehr“), sein heftig wirbelnder Eisläuferwalzer und der Marsch, der direkt in „Rückkehr“ überleitet, gehören zu seinen reizvollsten Eingebungen. Das gilt auch für den Gebrauch von Tremolando-Streichern in „Lagerfeuer“, um das Schimmern und Glimmen des Feuers darzustellen. Der Kinderchor, der in „Versammlung der Pioniere“ singt, nimmt den noch umfassenderen Einsatz von Kinderstimmen (solo und en masse) in Friedenswacht vorweg, in dessen Gala-Finale sie große Schwärme von (symbolträchtigen) Tauben anschaulich in den sommerlichen Himmel über Moskau aufsteigen lassen. Ich wußte, daß Prokofjew mehrere Werke für Kinder komponiert hatte. Das häßliche Entlein nach Andersen und die Erzählungen der alten Großmutter –, und ich träumte davon, ich könnte ihn dazu veranlassen, daß er etwas für uns schrieb. Es war meine größte Leidenschaft, Kreativität zu stimulieren und dadurch den Schatz künstlerischer Werke für Kinder zu mehren. Was ich im Sinn hatte, war ein Märchen für Sinfonieorchester, in dem sich Musik und Sprechtext verbinden sollten. Ich hatte noch nie von einem solchen Werk gehört, aber der Gedanke erschien mir nicht unsinnig: Warum sollte man nicht versuchen, Sprache und Musik auf unterhaltsame Weise zu verknüpfen und so die Aufmerksamkeit des kindlichen Publikums zu bannen? Der Typ des „sinfonischen Märchens“, das mir vorschwebte, konnte uns helfen, die Kinder mit den Musikinstrumenten und ihren spezifischen Klängen vertraut zu machen. Sollte ich vielleicht einen unserer üblichen Komponisten damit beauftragen? Nein, der einzige Name, der mir dazu einfiel, war Sergei Prokofjew. Damals hatte Prokofjew keine eigene Wohnung in Moskau, sondern lebte im Hotel Nationale. Als ich dort ankam, war er recht gastfreundlich und bot mir Kaffee an, den er selbst gekocht hatte. Er schmeckte ziemlich gut, und es gab viele Köstlichkeiten zu essen. Ich sah mich um. Das Klavier war aufgeklappt, und überall Iag Notenpapier herum. Bücher auf dem Tisch, und außerdem ein Schachbrett mit Figuren darauf. Mein Gastgeber strotzte offensichtlich vor Energie und hatte viele verschiedene Interessen, aber es herrschte Ordnung in diesem Chaos. Ich mußte meine Sondierung beginnen, sonst bestand die Gefahr, daß er mir irgendwohin davoneilte. Wie sollte ich anfangen? „Erhalten ihre Jungen Musikunterricht?“ „Ja, schon, aber das ist vergeudete Zeit. Nicht das kleinste bißchen Talent.“ Es war eindeutig, daß ich damit nicht weiterkommen würde. Ich fing von vorn an. „Wann haben sie zum ersten Mal ein Orchester gehört?“ „Mit neun Jahren, als ich nach Petersburg mitgenommen wurde, um den Faust zu hören. Das hat natürlich einen unauslöschlichen Eindruck hinterlassen. Die Musik, die Kostüme, die Handlung. Wie alle kleinen Jungen hat mich besonders der Schwertkampf beeindruckt.“ Endlich hatte ich ihn soweit; ich setzte zu einer gründlich eingeübten Rede an. Prokofjew schien interessiert. Ich legte eingehend meinen Plan dar und versuchte, so konkret wie möglich zu bleiben, was ihm gefiel. Einige Tage später klingelte das Telefon: Er war einverstanden. Er saß einen ganzen Abend lang an meinem Klavier und erarbeitete einen Ablauf, eine Geschichte. Wir waren uns darüber einig, daß der Hauptzweck darin bestand, Kindern in sehr frühem AIter die Instrumente des Orchesters nahezubringen. Ich machte den Vorschlag, als Figuren Säugetiere oder Vögel zu nehmen, und mindestens eine menschliche Person. Das Endergebnis war, daß das Zentrale Kindertheater Prokofjew offiziell beauftragte, ein sinfonisches Werk zu schreiben, gegen ein im Grunde peinlich geringes Entgelt, aber mehr konnten wir nicht aufbringen. Prokofjew unterzeichnete ohne Murren den Vertrag. Daraufhin löste er sich in Luft auf. Ich wartete geduldig, warf jedoch meinem Telefon häufig beschwörende, wenn nicht gar feindselige Blicke zu. Und dann klingelte es! Bei jener allerersten Aufführung in meinem Büro war ungefähr ein Dutzend Kinder zugegen. „Eines frühen Morgens“, begann ich, „machte der kleine Peter das Tor auf und ging hinaus, auf eine weite grüne Weise zu …“ Und so weiter. Den Kindern gefiel das Stück, das merkte ich gleich an der Art, wie sie zuhörten. Kinder sprechen einem Werk manchmal begeistertes Lob aus, wenn es vorbei ist, aber während der Vorstellung haben sie gezappelt und geschwatzt. In diesem Fall jedoch saßen die kleinen Wichte mucksmäuschenstill da, obwohl die Sinfonie 24 Minuten dauerte, ohne eine Pause. „Ist es schon zuende?“, fragte eine enttäuschte Stimme, und einige andere schrien nach mehr. Prokofjew mußte den abschließenden Marsch noch dreimal spielen. Am 5. Mai 1936 sollte das Kindersinfonieorchester unseres Theaters bei einem Festival sowjetischer Kunst spielen. Journalisten und Touristen aus Frankreich, Großbritannien und Amerika wurden erwartet. Wir hatten eine Überraschung für sie bereit – ein neues Werk von Sergei Prokofjew, den sie gut kannten, ein Werk, das er nach seiner Rückkehr nach Moskau geschrieben hatte. Peter und der Wolf löste eine Sensation aus. Zeitungen und Zeitschriften im In- und Ausland schrieben über das Stück, und die Aufführung im Mai war der Beginn seines langen Lebens in den Konzertsälen der ganzen Welt. Wahrscheinlich hätte Prokofjew nie geglaubt, daß der jüngere der beiden Söhne, die er Natalia Satz gegenüber als umnusikalisch bezeichnete – Oleg, 1928 geboren –, eines Tages die Rolle des Sprechers in Peter und der Wolf übernehmen sollte. Noch mehr überrascht und zweifellos amüsiert hätte es ihn, zu wissen, daß das Stück seither von drei Generationen der Familie Prokofjew aufgezeichnet wurde. Lina, seine Frau, war die erste (1986, für Chandos); und nun hat Oleg, ein herausragender Maler und Bildhauer, den Text so bearbeitet, daß sein eigener Sohn Gabriel berücksichtigt wird, der die zweifache Leidenschaft seines Großvaters für Musik und Theater geerbt hat und mit seinen 15 Jahren bereits ein vollendeter Hornist und Schauspieler ist. Das Ergebnis läßt einen umso mehr bedauern, daß Prokofjew nie ein großangelegtes Theaterstück geschrieben hat, in dem Kinder mitspielen und -singen können.